Ask fellow campers about "Overnite RV Park" and nearby attractions. "Overnite" indeed! Definitely not a tourist mecca. OK for a night, but be prepared for noise from all directions. Very close to the interstate to the south, a large and active railroad yard to the north, (fortunately no whistles) and park is directly below the approach path to the airport with a fair amount of commercial traffic. Staff was pleasant, utilities were good, but everything is aging. (not the staff) There is a Pilot and McDonald's right across the street with easy in and out. Seemed a bit pricey but we were tired from driving all day. We camped at Overnite RV Park in a Motorhome. 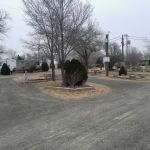 This is an older RV Campground, but in good shape and clean. The staff was great at check-in. I needed a washer for my water supply hose and they just gave me one. Some airport noise. Close to the Big Texan. There's a limo service that will pick you up, no charge. We camped at Overnite RV Park in a Fifth Wheel. You need to hit the Big Texan. Great steak, even if you don't go for the big 72 oz challenge. Cadillac Ranch is on the other side of Amarillo. Need to check that off also. Smaller, older park. PROS: Helpful staff. Long sites, including several with private pet runs. Short drive to the famous Big Texan restaurant. Roads are somewhat narrow but no problems getting our 65-foot big rig in/out following directions. CONS: Lots of road noise being right by the highway. We stopped for one night during a horrible storm so didn't see/use much of the park at all and can't comment further. We will probably stop here again for a night on our way back across the country. We camped at Overnite RV Park in a Fifth Wheel. This park is declining, but it is still a good overnight stop. It has FHU sites that are level and easy to access. It is close to I-40 and there is some road noise, but nothing that bothered us. The office staff was friendly both on the phone and at check-in. There is no pool or wi-fi. Our AT&T hotspot worked great. We travel this way fairly frequently and will likely stay here again. We camped at Overnite RV Park in a Motorhome. If you need repair, the Premier Truck Group of Amarillo is a good place to take a motorhome. 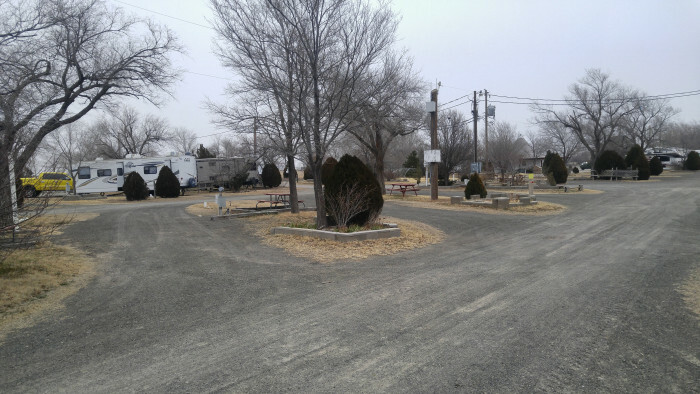 This is an older RV park that is very easy for access to I-40 on East side of Amarillo, near Big Texan Steak House. You will get some noise from the highway and an airplane or two. The staff is very nice. Our site was a level gravel pull-through w/FHU and wide enough for slides. All utilities worked fine but no WiFi at all (signs in office states this). They have a fenced dog park and ample space to walk a dog. We have stayed here many times and we will stay here again. The price is right for an overnight stop. Never used the facilities so can't comment on them. We camped at Overnite RV Park in a Motorhome. A Pilot Flying J is across the street. 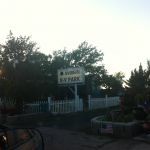 This is an older but pleasant RV park close to I-40. There was some road noise and airplane noise. Staff is very nice. All sites are level, gravel pull-through with FHU, and of various lengths. All utilities worked fine but there is no WiFi. There is a small fenced dog park and plenty of green areas to walk a dog. There are also a few "pet sites" with a fenced in picnic area. The park could use some TLC but it is fine for an overnight at a reasonable price. We camped at Overnite RV Park in a Motorhome. As the name indicates the park is well set with pull through sites that are flat and wide enough for slides. Nice little patch of grass for patio ares with a picnic table. Easy off/on I-40 with a Pilot Flying J Travel Ctr. right across the street. We were 3rd row back so Highway noise wasn't an issue but air traffic was occasionally. We would stay here again. We camped at Overnite RV Park in a Motorhome. We stayed one night and it was fine. The park must have been very nice at one time and you can see evidence of long-ago efforts to beautify the area. But it is getting tired and needs TLC. Spaces are adequate and all utilities worked. Office attendant was pleasant. Easy in and out. Price is reasonable for Amarillo area. We camped at Overnite RV Park in a Motorhome. We had a large pull-through site with grass. We stayed hooked up for an overnight stay. Not one review mentioned that it is near the train tracks and an airport where the military jets flew overhead very low. Good thing we aren't bothered by the noise. Bathrooms could use some updating. We camped at Overnite RV Park in a Travel Trailer. Our second time at this park. Love the fact that they have several sites with small, fenced dog yards right at the site! No Wi-Fi but phone reception was good so you can use the IPhone hot spot. The park is on the Loop around Amarillo so we just used that in the morning to go North towards Dumas. There is a Pilot station and McDonalds right across the street. We will stay here again if in the area. We camped at Overnite RV Park in a Fifth Wheel. Easy to get to as the name says, a good Overnighter. Ok for big rigs. This is an older RV park but we always stop here on the way through Amarillo. You will hear train whistles occasionally across the hill. Also, it's under the landing flight path for the Amarillo airport and was quite thrilling to watch some of the jets come in and land! (we are former pilots) But not sure how other folks would react seeing the plane lights coming toward you. There's a big truck stop across the street so it's convenient to refuel when stopping here. We requested a larger pull though at the end of the park. Looks like there are scattered full-timers around. Coming in, the park has several large speed bumps to get over. Go slow! We camped at Overnite RV Park in a Motorhome. We use Overnite RV Park when stopping in Amarillo. The staff is always friendly, park is clean, sites are pull thru so easy in/easy out. Close to interstate and airport but the noise does not bother us. We camped at Overnite RV Park in a Travel Trailer. We had a pull through. There is plenty of grass around for walking the dog. No wifi but Verizon worked fine. They do have cable and it worked well. It's not far from restaurants and shopping. We would stay again if in the area. We camped at Overnite RV Park in a Motorhome. This is a very convenient park for an overnight stay. Large fuel stop directly across the street and easy access for big rigs. The rear spaces are very long pull thrus and plenty of room to walk pets. Good ota tv and cell. Very friendly and helpful staff. It's in the flight path for the AFB, so if you don't like jet noise, it might be a little uncomfortable during the day. No problem at night. Good place to stay as you go thru Amarillo. We stay here at least twice every year. We camped at Overnite RV Park in a Motorhome. Very easy on-and-off overnite park off the interstate. Very long gravel pull through. Our site had a large fenced dog pen and a covered picnic table. Sites with fairly well-maintained grass areas. Utilities well placed and easy to use. No cable or Wifi but had excellent OTA stations and Verizon service. We asked for a site with the fenced dog pen and it also included a gazebo type covered picnic table. In addition there is a fairly large off-leash dog area at the rear of the park. While we did not use the restrooms they were at the front of the park near the office so a site closer to the office for those meeting the restrooms might be more convenient if needed. The pool was empty however I am unsure whether it was for cleaning or for the end of the season. In the morning there was some street noise from the access road to the freeway but it did not bother us during the night. We would certainly stay here again if passing through the area. We camped at Overnite RV Park in a Fifth Wheel. There was a Pilot and a Loves Travel Center as you exit the interstate. There is a McDonald's immediately across the street and several large restaurants within very close proximity. Great place for a one-nighter to rest up along a long journey to somewhere else but also a good place to stay longer if exploring Amarillo. We will be back! Found diesel fuel at Sam's Club for $.20 - $.40 less per gal than other stations in town. Winds in Texas are like no other. You would be wise to retract your awning at night or when you leave your RV or you may find that it is no longer usable when you return. Pilot gas station and a Subway across the street, within walking distance. Big Texan Steakhouse very close by. Since it was the hubby's birthday we went to Big Texan for a free prime rib dinner. Everyone has to do this once. The Big Texan restaurant is just one exit west on I-40. Don't miss steak dinner at the nearby Big Texan. We also found the Palo Duro Indian Trading Post about 1.5 miles to the West well worth a visit. Took the limo to Big Texan steakhouse. Way overrated! Horrible experience with the food. After sending back once ended up not eating any of the dinner. Don't bother. Are you affiliated with Overnite RV Park ?